Sometimes I wonder which of the things that we have will become the heirlooms of tomorrow. I’m not talking about the things we try to preserve, like photographs, scrapbooks, and collectibles. I mean the everyday objects that we use and enjoy without thinking too much about them. What will survive to make future generations wonder about us? 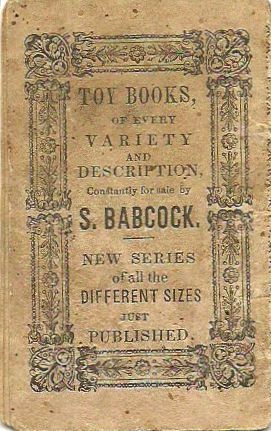 I bet Moses Levant Smith never expected his little toy book to outlive him by 107 years. And yet I’ve become the latest in a long string of custodians of Moses’ book. On a recent visit, my father-in-law pulled a small envelope from his pocket with great relish, and produced a little object he had found mixed in with a shoebox full of office-type odds and ends from his last move. He knew I’d be delighted with it, and he was right. 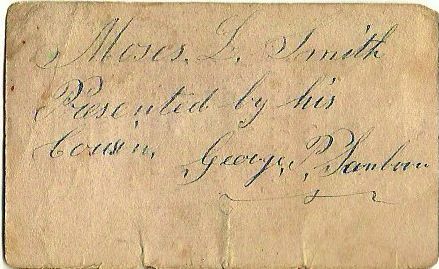 Now that’s an inscription sure to make a family historian’s heart swoon. Moses Levant Smith was born in January 1835 in Alabama, according to family and census records. (1) He would have been five years old when this book was published. 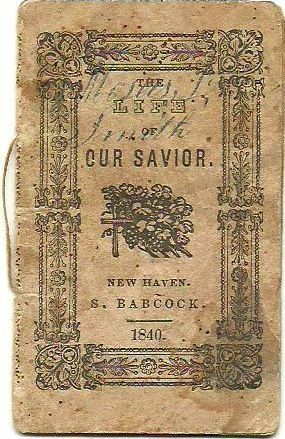 By then his father, Dr. Joseph Haven Smith, had died. His mother, Annah Carrington Ives Smith, had taken the children back to Loudonville, Ohio, to live among their relatives. (2) He went by his middle name, Levant, in most of the records I’ve found him in. 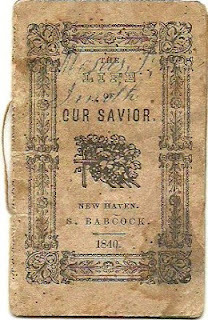 The Sanborn, Smith, and Ives families had long histories in New Hampshire and Connecticut. 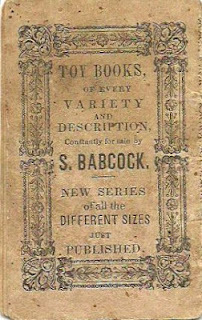 When you think about how much children love miniature things—dollhouses, toy figures, little farm and zoo animals—it’s not hard to imagine that Moses Levant treasured his tiny book. The fact that it survives in good condition to this day, through a chain of indirect descendants and countless moves to various cities and states, just astounds me. It makes me wonder what little things of mine might make some future family historian smile. What helps an object like this to be kept and handed down, instead of being thrown out or given away? What creates an heirloom? (1) 1860 U.S. census, Russell Township, Geauga County, Ohio, population schedule, p. 13, dwelling 111, family 94, L. M. Smith; digital image, Ancestry (www.ancestry.com: accessed 1 March 2012), citing NARA microfilm publication M653, roll 967. (2) Hattie (Boynton) Whiting, Ives-Smith Family History, ca. November 1949; Crites Family Papers, compiled by Harold R. Crites, currently in possession of Shelley Bishop. The family history does not provide source citations. Wow! That really is a treasure. 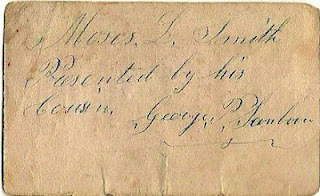 I love George's beautiful handwriting. I STILL love little things! 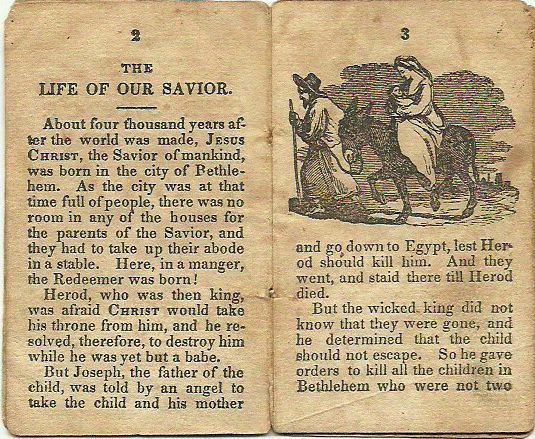 Lucky you to be entrusted with the care of Moses's book. 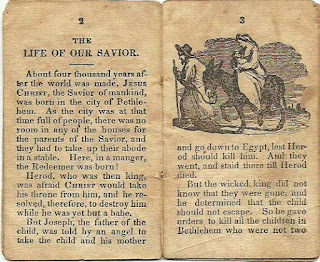 I wonder how many generations of children held that little book, and how many generations of mothers read it to their little ones. Despite its age it looks really well-cared for. I think the language is interesting. The use of words like "abode," "resolved," and "determined" are not ones we usually use with little children these days.